The high degree of fragmentation in the global generators market is increasingly becoming difficult for regional as well as global players to sustain their presence in this marketplace. This is evident in the aggressive consolidation efforts and formulation of strategies for expansion of distribution networks, notes a new study by Transparency Market Research (TMR). 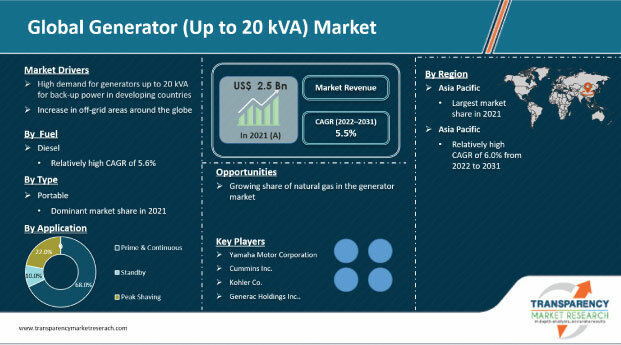 The key players in the global generator market include Cummins Inc., Generac Holdings Inc., Mitsubishi Heavy industries Ltd., Caterpillar Inc., Kohler Co., and Briggs & Stratton Corporation that collectively accounted for substantial revenue generation in the global generators market in 2015. With regulations in place that control CO2 emissions and monitor efficiency of generators, key market players are striving to develop innovative products to stay competitive in the market. Other functionalities that key players are focused on include noise reduction, remote monitoring, wireless connectivity, and power system integration. “Companies that cater to changing consumer preferences and have distribution networks in remote areas of emerging economies will receive competitive edge in this market,” says a TMR analyst. The global generator market is expected to expand at a CAGR of 4.58% between 2016 and 2024 for the market’s valuation to reach US$24.76 bn by 2024 increasing from US$16.61 bn in 2015. On the basis of power rating, high power rating (350-1000 kVA) generator sets was the leading segment in 2015 due to their use for both commercial and residential power backup needs. However, the segment of very high power rating (above 1000 kVA) generator sets will display the fastest growth at a CAGR of 6.51% from 2016 to 2024. In terms of fuel type, diesel generator sets is the leading segment as they are widely used across the world. The conventions, however, are expected to change in the long-term future with utilization of natural gas generator sets to surpass that of diesel generator sets. The segment of natural gas generator set is expected to display the fastest growth at a CAGR of 7.94% between 2016 and 2024. This change from conventionally used diesel generator sets to natural gas generator sets is mainly due to regulations in place that keep a close watch on harmful emissions. Prime continuous power stood as the leading application segment in 2015 contributing a revenue of US$8.12 bn to the global market in that year. The commercial and industrial end-use segment held the largest share of 58.50% in the global market in 2015. The escalating fuel prices and demand-supply gap in electricity transmission is driving the installation of generators among industrial and commercial consumers. With increasing power transmission load that are heavy for existing grid infrastructure, power outages are commonality in emerging economies. However, this results in loss of business worth millions of dollars due to downtime of commercial and industrial operations. Thus, the demand for generators is anticipated to remain robust until 2024. However, players in the market face several growth impediments. Strict mandates in place by regulatory bodies for minimizing emissions is limiting the installation of conventional generator sets. This, however, is expected to translate into opportunities for natural gas-fueled generator sets. Regardless of fuel type or power rating, generators need to meet expectations in terms of reduced noise, greater efficiency, and wireless connectivity. Despite several factors that are favoring the installation of generators, the growth of the generator market is expected to display a marginal dip due to upgradation of electricity transmission networks to handle high volume load that has reduced power outages considerably.